STREAM is an intelligent ship design concept that stands for Sustainable Transport, Reliable, Economic, Ambitious ship know-how. STREAM connects cutting edge ship technology with specific today’s demands of owners, charterers and port operators. It enables best-in-class economical and environmental friendly ship operations; now, tomorrow and in future. In view of the announced new IMO regulation related to environmental friendly ship operations late 2009 TECHNOLOG created the idea for this innovative and novel design concept and since then developed the first medium sized container vessel in partnership with the IPP Engineering Partner Pool – a German Alliance of renowned Engineering Companies – and several also well known and qualified Joint Development Partners such as Germanischer Lloyd, MAN Diesel&Turbo, Siemens, Cargotec, Heinen and Hopman, TGE Marine Gas Engineering GmbH, MMG Mecklenburg Metall Guss and Becker Marine Systems. Furthermore HSVAHamburgische Schiffbau-Versuchsanstalt and GL’s FutureShip were involved as JDP in providing their expertise in software tools utilizing computational fluid dynamics (CFD) to generate hull forms with improved hydrodynamic properties. Altogether they provided solutions to minimize the vessel’s fuel consumption as well as re-sistance in water and air while maximizing its cargo capacity. STREAM focuses on saving energy while the ship is at sea. It combines state of the art power generation technology and sophisticated propulsion system with intelligent power control and management system together with hydrodynamic optimizations. Compliance with IMO Tier III is guaranteed with best Energy Efficiency Design Index (EEDI) and the vessel design received the Approval in Principle (AiP) certificate from GL in September 2012. A new patented container stowage system provides an optimized container cargo and reefer intake. The construction principle allows a modular step by step installation of Waste Heat Recovery System (WHRS) and LNG plant with processing. It can be observed that the marine industry is more appreciating the envisaged IMO regulations coming into force in 2015 and 2020 for which dual fuel engines will be developed in time and LNG supplies will be made available as promised by the respective companies. Subsequently also shipyards have become interested in LNG applications. Licences for the construction of the STREAM vessel were sold to SUMEC Marine Company in April 2013. The company is now intensively promoting the STREAM design for construction at the top shipyards in Jiangsu Province. Just recently TECHNOLOG has been successful by applying the STREAM power generation and propulsion concept for UASC A14- Class and A18-Class SLCV’s ordered with Hyundai Heavy Industries and Hyunday Samho Heavy Industries. TECHNOLOG experts elaborated for these ves-sels conceptual layouts as basis for the well initiated international Request for Tender (RFT). Fur-thermore SUMEC-China has signed a first LOI with a European ship-owner to deliver 3 plus op-tional further 3 STREAM 4500LNG in 2015. 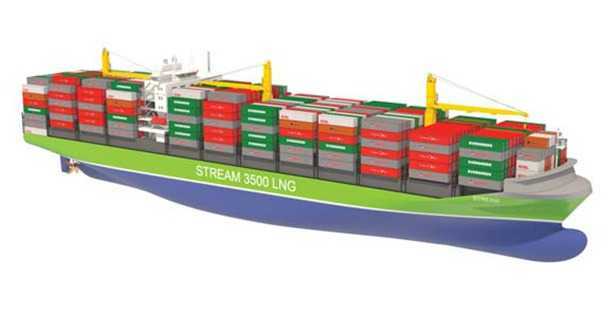 All vessel designs meet all future requirements set forth by International Maritime Organization (IMO) and the vessels will be capable of saving a great many hundred of thousand tonnes of CO2 emissions in the course of its lifecycle and also cut down emissions of nitric oxide and sulphur oxide gases base on LNG fuel properties. 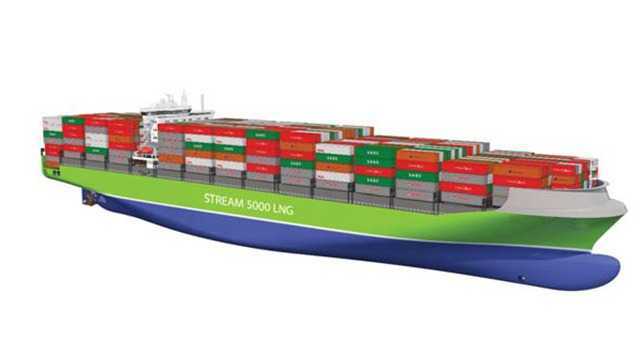 All STREAM container vessels will be capable of sailing on both heavy fuel oil (HFO) and lique-fied natural gas (LNG). The vessel will be a fully cellular open-top container vessel subdivided into several double 40ft holds. The open-top design allows cargo operations with the benefits of two separate stacks below and above deck. This allows best container intake with lowest possible vertical container stowage height for best transverse stability and maximum stowage flexibility due to dispose the full range of con-tainer sizes in use internationally. If required all hatches can be equipped with hatch covers. All of the 40ft container slots in the hold and on deck can accommodate reefer containers. Special ventilation systems will be installed to suit these refer slots. The forward hold is designed to carry dangerous goods. The LNG fuel systems of the vessel consists of fixed bunker tanks inside the vessel and if required by the operator of smaller type vessels a portable deck-mounted LNG Bunker- Container system can be used to provide extra capacity. This Bunker-Container system was in particular developed for the smaller vessels STREAM 2100LNG and STREAM 3500LNG. spaces and the crew’s quarters. Armoured shutter plates can be closed in the central entrance lobby to cut off the interior of the vessel, including the deck house from the deck. The entire energy generation on board will be controlled by a minimum-fuel-consumption-power-management-system (MFC-PMS) a joint development of Siemens and TECHNOLOG. The vessel will also be equipped with a Waste Heat Recovery System (WHRS) for even greater fuel efficiency. All the ship’s mechanical systems have been intelligently coordinated so as to result in significantly reduced fuel consumption. For example, the main engine not only generates the necessary propulsion power – it also provides all the electricity that is needed on board. A waste heat recovery sys-tem (WHRS) meanwhile obtains additional energy from the exhaust, resulting in an even higher degree of efficiency. The propulsion system on board has been optimised for economical operation at speeds ranging from 12 to 18 knots, but at the same time it allows for catch-up speeds of up to 21 knots or more. 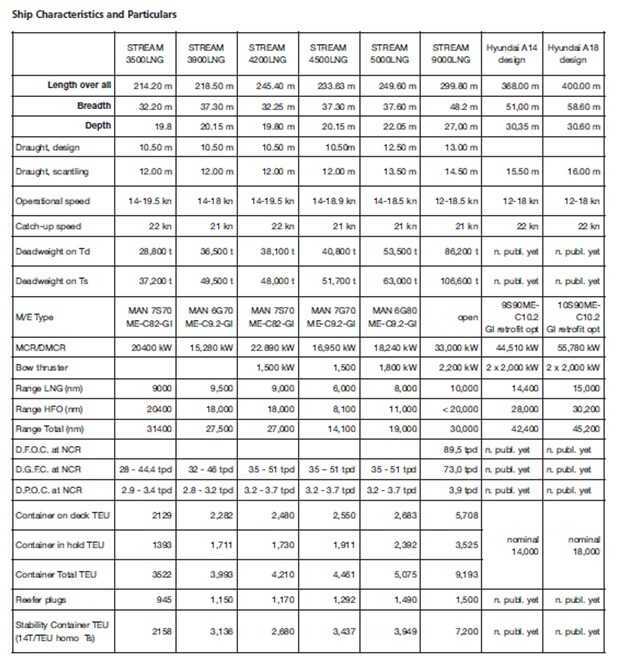 Depending on the type and size of vessels, fuel savings will be between 30 and 40 percent in comparison with the most recently delivered new ships of a similar category. The STREAM container ships offer a forward-looking and patented container storage system with-out hatch covers. The stopper element that comes with it allows that container tiers can be piled twice as high as in the past, even without the help of cell guides. The system makes it possible for standard 20 or 40 foot containers to be loaded or unloaded one stack at a time, and containers of abnormal width or length such as 45, 48 and 49 foot units can be handled with equal ease. This avoids the expense of cargo relocation when in harbour, and so shortens the length of a ship’s stay in port to a significant degree. Thanks to a special ventilation system nearly all 40-foot slots in the hold and up to three layers on deck can be used to stow refrigerated containers. 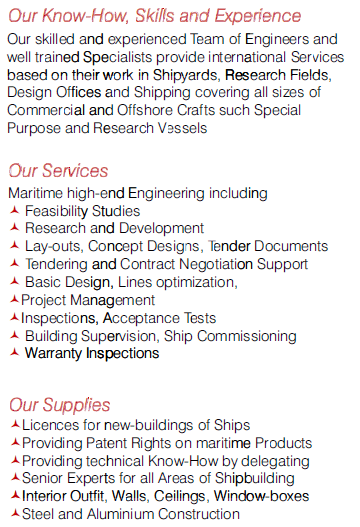 For more than three decades, Hamburg-based TECHNOLOG GmbH Handels- und Beteiligungsgesellschaft für Technologie (a trading and holding company for technology) has been functioning as a specialist trading company of-fering maritime products, marketing support, technology brokerage and consultancy to ship-owners and shipyards in-cluding project management, plan approval, supervision and commissioning of ships. Further information may be found at www.technolog.biz.